58 days until the CFA exam. Be prepared with Kaplan Schweser. 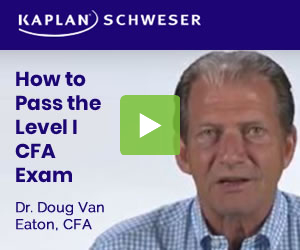 Make the most of your CFA® Progam prep in one weekend! Join renowned instructors, Peter Olinto, Darren Degraaf & David Hetherington in May for a live, two-day intensive final review class. Join the world's largest online community of CFA, CAIA and FRM candidates. No thanks, I don't want to increase my probability of passing. Is the CFA® Charter Worth It? AnalystForum is an online community designed exclusively for CFA candidates and charterholders to discuss the Chartered Financial Analyst program. CFA® and Chartered Financial Analyst are trademarks owned by CFA Institute. CAIA® and Chartered Alternative Investment Analyst are trademarks owned by Chartered Alternative Investment Analyst Association. FRM® and Financial Risk Manager are trademarks owned by Global Association of Risk Professionals. © 2018 AnalystForum. All rights reserved.